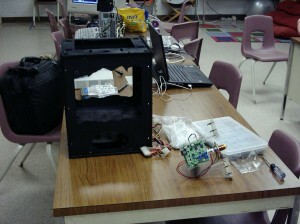 Our MakerBot parts came in at the space so we had a build day Sunday. We made some modifications to the case design to make a cave themed MakerBot, complete with stalactites and stalagmites and a place for a nice acrylic back-lit CCCKC logo. We got everything sanded and painted, assembled the extruder and case, etc. only to find out that in batch 5 the BOM of the MakerBot changed and now our X and Y axis components that I cut out weeks ago don't work with the current rods and bearings! The Thingiverse page for the MakerBot hasn't been updated, but if you look in the subversion repo under batch 5 you'll find DXFs of the newer design. From these files it seems they've moved away from the 1/8" plywood in favor of 1/4" for the X and Y axis components in this new design as well. I've cut out another set of parts out of 1/4" Birch plywood and we'll make another go at construction on Tuesday. Hopefully we'll be up and printing by the weekend! This entry was posted on Monday, September 28th, 2009 at 7:53 pm and is filed under Info, News. You can follow any responses to this entry through the RSS 2.0 feed. You can leave a response, or trackback from your own site.